Free Energy Data (FRED) is an open-access tool designed to assist government and corporate energy planners to set long-term goals, identify lessons learned from other organizations, and track progress by making energy information more accessible, consistent, and transparent across organizations. Free Energy Data (FRED) is an open-access tool designed to assist government and corporate energy planners to set long-term goals, identify lessons learned from other organizations, and track progress by making energy information more accessible, consistent, and transparent across organizations. 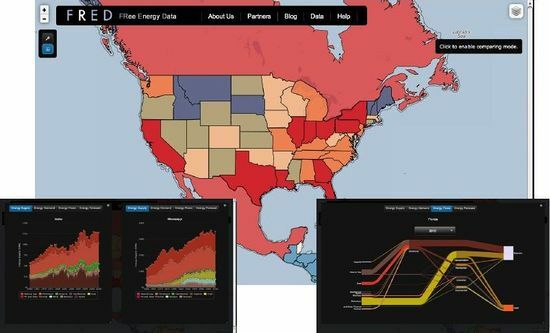 FRED collects energy supply and demand data at a state and national level and normalizes and displays this data in simple, easy-to-understand maps, time series, and flow diagrams. Side-by-side comparisons, energy flow (Sankey) diagrams and forecast scenarios help prioritize future energy policies. Users are encouraged to upload their own energy data to compare their organization's performance against other states and user-provided regions, so every user of FRED, from local to national, will increase the value to every other user in the community.